Daniel Warnell (Wournell, Wornell, Warner) (1814-1888) was born in Chezzetcook and was first recorded in census records as living in the Jeddore area in 1851, although his son William was recorded as having been born at Salmon River ridge in 1843. Daniel worked as a fisherman and miller. According to census records, he and his wife Louisa Warnell were still living at Salmon River Bridge, just across from Myers Point throughout the 1860s. Crown Land maps showing original land grants list D. Wournell’s name at the present location of the Salmon River House. Sources indicate that an original cottage built by the Warnell family in 1853 was incorporated into the structure of the present day Salmon River House. It is said that the original owners of the Salmon River House at the Eastern end of the Salmon River Bridge were Daniel’s son Albert W. (1847-1907) and his wife Eliza Jane (Crockett) Warnell (1849-1926). They may have built onto the original 1853 cottage. Albert was a lumberman and he and his family were living with his brother William at Salmon River Bridge in 1871. He applied for fifty acres of Crown Land at the mouth of Salmon River in 1888 and was not living with his brother by 1901. Crown Land maps clearly show the original land granted to the Warnells at the mouth of Salmon River. The grant at the current location of the Salmon River House is in the name of A. W. & D. Wournell. Salmon River House enjoyed a wide spread reputation while owned and operated by the Myers family, revered by travellers for its hospitality, Mrs. Myers’ home-cooked meals, and the tall tales told by Mr. Myers. It was a favourite destination for travellers on hunting and fishing holidays, as Mr. Myers pioneered guiding and outfitting in the area and had several camps with log cabins set up at various lakes in the woods where he and his guides took parties of vacationers from the city and elsewhere. The Myers family owned the property until it was purchased by Adrien and Norma Blanchette in 1988, who re-opened it as the Salmon River Country House Inn in 1989 and established their own reputation for home-cooked meals, hospitality, and the beauty of the location. Norma passed away in 1997 but Adrien continued to operate the business and opened the Lobster Shack Restaurant with his second wife, Elizabeth Schwarzer, several years later. The business was awarded the Excellence in Food and Beverage award by the Tourist Industry Association in 2001. Between 1997 and 2007, the restaurant was expanded and renovated to accommodate increased business. The property may have changed hands sometime after 2007 but the inn and restaurant remained open until about July of 2011 at which time the property was again put up for sale. The property was purchased by Margit and Ernst Wechsler in December of 2012. 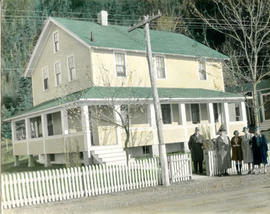 The Wechslers soon re-opened the Salmon River House as an inn and restaurant once again, which continues to operate today. Records were donated to the Eastern Shore Archives by Margit Wechsler in 2013. Fonds consists of records generated and accumulated by the proprietors of the Salmon River House between 1932 and 2002. Included in the fonds are hotel registers, historical information about the Salmon River House, photographs of the house in various years, and a menu listing dishes served there. The majority of the records date to the period in which the house was owned by the Myers family. Some of the ledgers are in fragile condition and have been wrapped and stored separately. Donated to the Eastern Shore Archives by Margit Wechsler in 2013. The hotel registers have been arranged chronologically, with the exception of those that are fragile and are housed separately. Copies of the history of the Salmon River House have been placed in the vertical files. Includes: 7 photographs, 6 ledgers, 1 menu, 2 leaves of textual records. Faulkner, Jean (c.1947). The history of the Salmon River House. 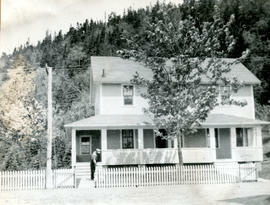 Salmon River House fonds [2013.041], Eastern Shore Archives, Lake Charlotte, NS. Jennex, Helen (1976). Reminiscence. RC-236, Eastern Shore Archives, Lake Charlotte, NS. [Serving up friendly hospitality for 87 years: Salmon River House celebrates 87 years of service to the travelling public on the Eastern Shore]. Salmon River House fonds [2013.041], Eastern Shore Archives, Lake Charlotte, NS. Stevens, Robert Kim (2001). Eastern Shore families: Head of Jeddore including the localities of Head of Jeddore, Myers Point, Oyster Pond, Salmon River Bridge, Hartlin Settlement. Lake Charlotte: Maritime Imprints.